We’ve all heard of some of the great games that have come out of the DoubleFine studios: Stacking, Pyschonaughts, Brutal Legend and the up and coming Broken Age. However, we’re looking at Costume Quest instead. Costume Quest is an adorable and hilarious RPG where you enter the world of squabbling siblings Reynold and Wren. You must choose a sibling to play as and after selecting Reynold, the quest begins to save our sister Wren who has been captured by the evil Grubbins. Reynold must go around collecting and completing missions in return for candy to spend on upgrades to use in battle rounds. 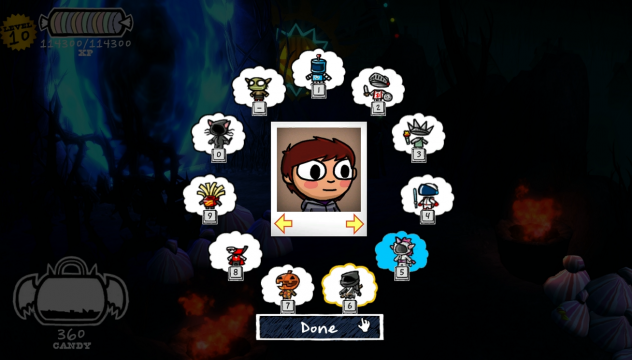 The player also has to find materials in order to create new, magical costumes. These costumes all have different abilities, and you must equip different ones to complete your quest and defeat enemies in battle. 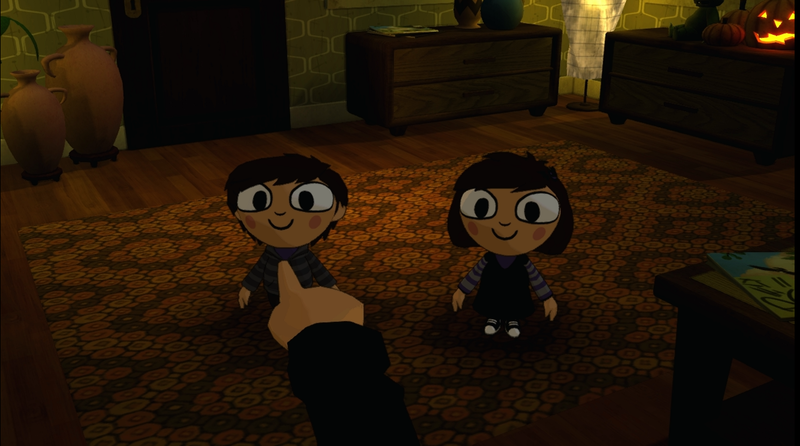 The exploration part of the game is done with a third person camera overseeing your actions as you search for Wren, make new friends and trick-or-treat. The controls are basic but intuitive, you move around as you would expect and you also have a special ability that comes with the costume you are wearing e.g. the robot can move faster or the knight can use his shield to protect you. Different costumes and their special abilities are needed to progress, such as jumping over fences or shielding through dangerous areas. It can occasionally bit a bit awkward to control, you may be trying to jump a fence and not line it out properly and you have to realign, and that can get a bit frustrating. The different battle abilities of each costume makes you want to acquire them all and try them all out. Some, such as the box of fries costume, perfectly display the humour of the game and add all round adorableness to the adventure. Along with exploring and completing missions, there is also a Final Fantasy style turn-based battle system, which, admittedly, can be a bit awkward if you’re not using a controller, but it is by no means unplayable. These battles can be activated by a nasty Grubbin greeting you as you trick-or-treat in your neighbourhood, or by Grubbins catching you in the open in a Pokemon style aggro system. The costumes you wear affect your powers in the battle, all the basics are there; buffs, heals and AOE but you can find it very repetitive as you fight of boring Grubbin after Grubbin. The boss fights may appear difficult at first but they often drag on with no real change of tactics and are usually beatable upon first attempt. The battle scenes don’t really work, but something is needed to break up the adventuring, I just think that not enough is done to make you want to fight; you will find yourself trying to avoid battles as the game goes on, especially if you manage to aggro too many Grubbins in a row. The base game is about 6 hours long, comprised of three main sections that will take you about 2 hours each to complete. There is also DLC available which adds another adventure of a similar format. The graphics will be familiar if you have ever played a DoubleFine game before. It looks very similar to Stacking in some ways, and this is recognised in a self-referential easter egg hidden within the DLC. 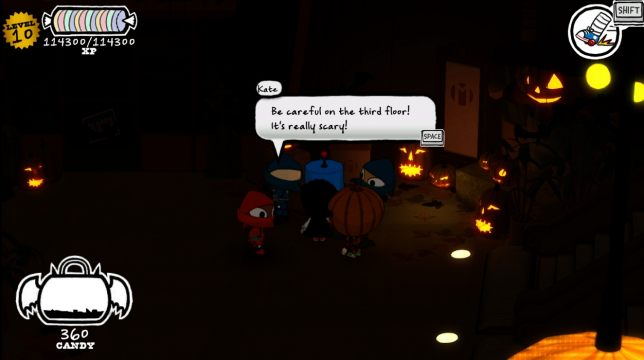 Costume Quest has a very strong cartoony look to it. The strong points are the endearingly cute face of Reynold as he blurts out blunt sarcastic quips and darkly comic phrases. There are occasional cut scenes that look a bit paper-crafty but you will find yourself trying your hardest not to skip them in case you miss something charmingly funny. The battle scenes have a more heroic feel to them as the costumes transform into warriors, losing the cute babyish features. The overall ambience given off by the general sound effects put you in the picture of a kid on his first Halloween; everything is larger than life, spookier and funnier than anything you’ve ever seen before. A sound effect comes with every costume’s special ability, they fit in well and add depth to the game but if you’re in a puzzle that requires constant use of the ability you’ll find it grating. I loved Costume Quest, and I’ve never wanted to sit and waste away time more than when I played this. I wanted to finish it, I wanted to know the story, and I didn’t want to leave Reynold behind. I’d happily have him with me at all times. I’m not sure if I would want to replay it, because I don’t want to lose Reynold again, but I fondly look back on my time playing it every so often. John Green once made the analogy that you could fall in love like you fall asleep “just a little, then all at once.” And I feel that way about a lot of my favourite games. It goes slow at first and then I can’t not think about it, but this one knocked me out and I loved it instantly. Buy it. Play it. Now is the perfect time to buy it. With DoubleFine working on Broken Age they are bundling it up with their other games and selling them on mass everywhere to raise money. You’ll find it cheap somewhere. For 6 hours content it’s probably not long enough to warrant the £11.99 price you’ll find it for on Steam (and that’s without the extra £3 for the dlc) but if you find it cheaper buy it. You won’t regret it.